After every Eagles game played on Sunday (the one Monday night game will be done on Tuesday), we will have the "Eagles Monday Morning Quarterback," article. It is a chance to give 10 observations from the Eagles game as well as another 10 observations from around the NFL. 1. I think whether head coach Andy Reid wants to admit it or not, he has a quarterback controversy. Michael Vick showed everyone why he was such an electrifying player before he went to prison. Additionally, he finally understood what pocket presence is and how to throw the football. His pass to tight end Brent Celek was a thing of beauty. He put the ball exactly where it needed to be-- over the two linebackers right into the hands of Celek. 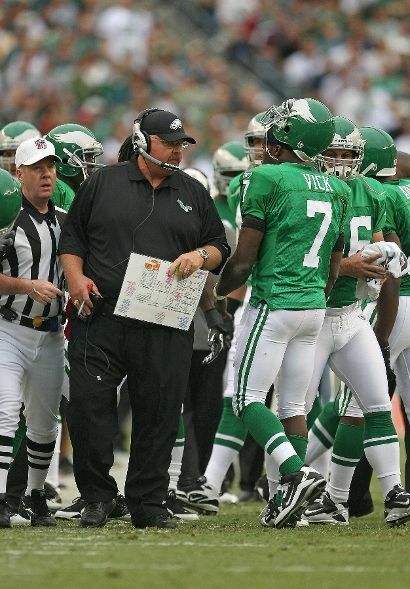 Moreover, it just seemed like the Eagles offense had more confidence in Vick then with Kolb. This is not a knock to Kolb, but when he was out there DeSean Jackson looked dejected. In addition Brent Celek was targeted zero times. As much as Kolb wants to be a starting quarterback in the NFL, he might just be a good backup. His decision-making skills are not where they need to be and he is just not as gifted as the elite QBs in this league. Vick gives the Eagles the best opportunity to win now, but the question is does he give the Eagles the best opportunity in the future. Before jumping on the Vick bandwagon fans need to remember that he is prone to making off the field mistakes and the Green Bay defense did not have an entire week to prepare for Vick. 2. I think Mike Bell is a lost cause for the Eagles. Throughout training camp, the preseason and now the regular season Bell has come up with the new injury. On Monday we found out he strained his toe, which is why he saw the field just once. It’s beginning to look like Bell was a bad decision. It would not be surprising if Bell continues to sit out that the Eagles just cut ties with him and give Martell Mallett a shot. Mallett actually fits the Eagles offense much better than Bell. Plus he will play through injuries. 3. I think WR DeSean Jackson is not as “elite” as he envisions. Look at the last couple of games against some of the NFLs best corner backs. Against Champ Bailey, he had four catches for 33 yards and a touchdown (on the touchdown he was not being covered by Bailey-- Bailey was on Celek). In the three games against Michael Jenkins last year, he had a combined eight receptions for 90 yards and a garbage time touchdown in the playoffs. Yesterday was more of the same. Up against former defensive player of the year in Charles Woodson, Jackson was shutdown until the third quarter. He finished the game with four receptions for 30 yards. While Jackson is a great player due to his receiving and return skills, he has come up small against very good competition. He might ask for the stars in a new deal, but until he shows up against upper echelon corners he won't get what he wants. 4. 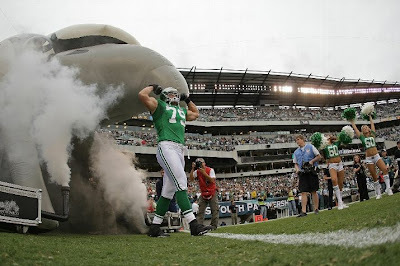 I think the offseason for the Eagles should be dedicated to revamping the offensive line. Besides Todd Herremans the o-line is not very good. Winston Justice is OK, but nothing to write home about. His backup Austin Howard is a strong candidate to replace him with his athleticism and mean streak. Nick Cole is an adequate backup, but has no business starting at right guard. Jamaal Jackson's career in an Eagle uniform might be dwindling down because he cannot be counted on to stay healthy. Finally, Jason Peters is getting paid a ton of money and is not producing. When the Eagles sent a first round pick to the Buffalo Bills and signed him to a hefty extension, they expected an elite left tackle. Instead they have acquired a penalty machine that seems to be content with being mediocre. Kolb might not make it through the season with this offensive line and is the weakest spot on the roster. 5. I think LeSean McCoy is going to be a star in Philadelphia. He looked the part in those kelly green jerseys. McCoy’s skills also looked phenomenal on Sunday. He reminded many Philadelphia fans of former Eagle Brian Westbrook. He was patient and followed his blockers, which lead to huge gains and even a touchdown. The extra muscle and bulk he added over the offseason is going to pay off late in the season. The only problem is Reid refuses to give him more touches. He needs 20-25 consistently if the Eagles expect to win. 6. I think the Eagles defense could be a top five defense by the end of the year. The keyword in that sentence was "could be." If Stewart Bradley stays healthy, then the Eagles defense will shine. When he was on the field, the defense shutdown one of the best quarterbacks in the game. More importantly, rookie Nate Allen and Ellis Hobbs will improve as the season goes on. While Hobbs was beaten badly by Greg Jennings, he has also not played significant snaps in nearly two years. As he gets more comfortable and neck gets stronger, he will improve. Allen made some mistakes yesterday, but he did not get beat deep or picked on by Aaron Rodgers. The Eagles may have finally found the replacement for Brian Dawkins. 7. I think the Eagles need to move on without cornerback Joselio Hanson. On a critical 3rd and goal, Hanson missed his assignment and was caught out of position. Ultimately it led to a Donald Driver touchdown reception. Yes, he had a pick earlier in the game, but Quintin Mikell should have originally intercepted the ball. He just happened to get a lucky bounce. Hanson is making a lot of money and rookie mistakes. The Eagles should let Dimitri Patterson and Trevard Lindley have a shot as the No. 3 cornerback. 8. I think defensive coordinator Sean McDermott is getting much more comfortable in his play calling. On critical third down plays in the fourth quarter (something the Packers QB Aaron Rodgers excelled at last year), the Eagles shut the Packers offense down. One of the reasons was due to McDermott's playcalling. He dialed up the right blitzes at the right time. More impressively, he had the defense step up to the challenge, when the Eagles backs were against the wall. Of course the Packers scored 27 points, but 17 points came with Bradley out of the game and three points on a 55-yard field goal. He may never be Jim Johnson, but he showed that he is deserving of the position. 9. I think the Eagles finally have a corps of linebackers that can stop the tight end. It has not been since the days of Carlos Emmons that the Eagles had a unit with the ability to shut down opponent’s tight ends and running backs. On Sunday the Eagles held Ryan Grant, Jermichael Finley and Brandon Jackson to five receptions for 59 yards. 10. I think the loss of Jamaal Jackson will hurt the Eagles more than fullback Leonard Weaver. Weaver is an All-Pro at his position, but the Eagles managed to win games with less talented fullbacks in the past. The Eagles cannot say the same without Jackson. The Eagles offense struggled mightily last year once Jackson went down. Furthermore, Jackson might be the most important player on the offensive line since he calls out blitz protection. Mike McGlynn will take over, but he has zero experience, which might make for an interesting Sunday in Detroit next week. 1. I think the NFC East is in a down year. The Cowboys, who were most expert’s pick to be the division champ and the Super Bowl participant from the NFC, looked miserable against the Redskins. Their offensive line couldn't protect QB Tony Romo and literally cost them the game. Plus the offensive gameplan was downright embarrassing. 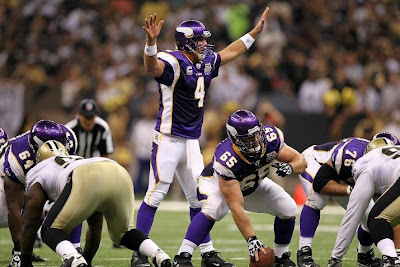 Washington has a good defense, but their offense looked as bad as Kevin Kolb's offense. As for the Giants, they were the cream of the crop on Sunday, which is not saying much. The Giants defense was torched in the first half, and then came up big in the second half. The offense still doesn't have a consistent running game. The NFC East might produce competitive games, but right now none of the teams are worth of being called Super Bowl contenders. 2. I think the Houston Texans had a brilliant gameplan. The plan was to keep the ball out of Peyton Manning's hands as much as possible. While fantasy owners were disappointed in Matt Schaub's numbers, the running game and milking of the clock was run to perfection. 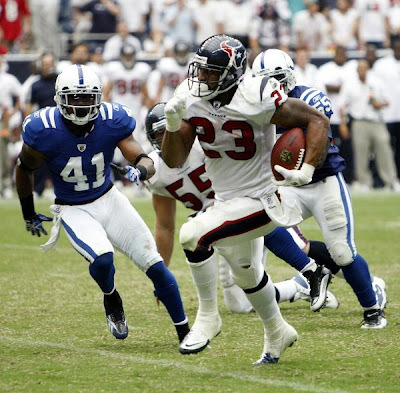 Arian Foster's huge day was vital, but it was head coach Gary Kubiak's commitment to the running game that assured the Texans the win and their place a Super Bowl contender. 3. I think the Atlanta Falcons are one of the most overrated teams in the NFL. There is no reason to go into Pittsburgh and lose to a team with Dennis Dixon starting at quarterback if you are a legit contender. They might make the playoffs, but do not expect them to get past the wildcard round. 4. I think the New England Patriots will win the East and be a top seed in the AFC. Not because of Tom Brady, but their defense. If you just glanced at the box score, it would be missing leading as it shows Cincinnati’s offense scoring 24 points. However, the game was out of reach at 31-3 and the Patriots let up. A major reason was the young Pats defense getting to Palmer and confusing him with many different looks. Additionally, they eliminated running back Cedric Benson and the running game. If the Patriots defense can score points along with Brady being Brady, then the Patriots could become the AFC’s best team once again. 5. I think Bears head coach Lovie Smith is still on the hot seat. 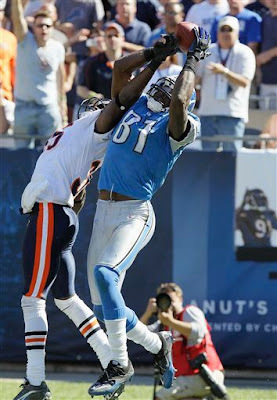 If Calvin Johnson’s “non-catch” was up to the naked eye and not the interpretation of the NFL rulebook then he would 0-1 on the season and in deep deep trouble. He is also extremely lucky that Matt Stafford was unable to finish the game. And he is even luckier that the four plays from the one-yard line, which resulted in no points did not comeback to haunt him. Down 14-13, Smith should have kicked the field to take the two-point lead. If he did that then Johnson's touchdown would not have even mattered. 6. I think the Cardinals front office should give WR Steve Breaston a nice thank you card and dinner for winning the game. After a Rams defensive tackle picked up a fumble and was running towards the end zone for a sure touchdown, Breaston saved the day. He stripped the ball at the one-yard line and the Cardinals recovered the ball in the end zone for a touchback. If the Rams score that defensive touchdown the Cardinals probably lose 20-17. 7. 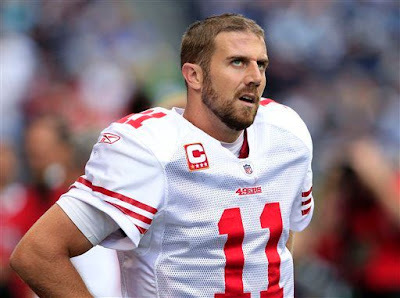 I think the Alex Smith experiment in San Francisco might be over. He has all the weapons in place, a good offensive line and a running game to lean on. Yet the Seahawks destroyed the Niners. Certainly the defense did not help, but Smith threw two costly interceptions. Moreover, he never utilized WR Michael Crabtree. For a team expected to win the division, it did not start off well. 8. I think the sleeper team of the AFC is the Tennessee Titans. The offense is going to be good because of Chris Johnson's ability to run the rock. Furthermore, Vince Young understands when to throw and when to take off. What really has the Titans on the rise is the defense. Also, lets not forget Jeff Fisher knows how to coach. 9. I think the Minnesota Vikings need to find a wide receiver until Sidney Rice gets back and fast. 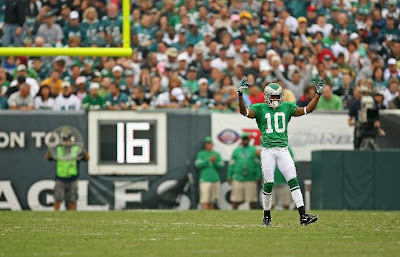 Percy Harvin is a poor man's DeSean Jackson, but is not polished enough as a wide receiver to be a No. 1 wide receiver. Plus team will send double coverage his way (along with Visanthe Shiancoe) and make Brett Favre beat them with mediocre wide receivers. Rice's size and ability to go up over smaller corners and pull the ball in was missing against the New Orleans Saints. While the Minnesota defense wore down by the end of the game, it might have been different if Rice were on the field. 10. I think the Packers are not winning the NFC crown unless cornerback Al Harris return at a high level and the offensive line improves. The other cornerbacks on the Packers roster (not named Charles Woodson) are average and not capable of shutting down elite offenses. Their offensive line allowed Rodgers to get hit too often. However, this appears to be a down year for the entire NFC, so they have a decent shot at getting a first round bye.